Photogrammetry is a 3-dimensional coordinate measuring technique that uses photographs as the fundamental medium for measurement. It is the practice of determining the geometric properties of objects from photographic images. Photogrammetric data with dense range data from scanners complement each other. Photogrammetry is more accurate in the x and y direction while range data is generally more accurate in the z direction. This range data can be supplied by techniques like LiDAR, Laser Scanners (using time of flight or triangulation), White-light digitizers and any other technique that scans an area and returns x, y, z coordinates for multiple discrete points (commonly called "point clouds"). Triangulation is the principle used by photogrammetry to produce 3-dimensional point measurements. By mathematically intersecting converging lines in space, the precise location of the point can be determined. 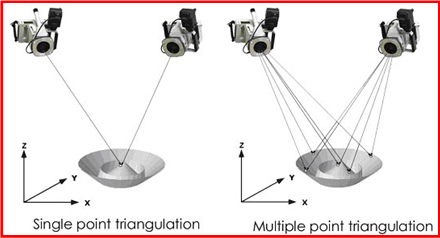 Unlike theodolites, photogrammetry can measure multiple points at a time with virtually no limit on the number of simultaneously triangulated points.